1. RéVive Intensité Line Erasing Serum ($600). It really works around my eyes and on a deep line I have on my chin. I checked the ingredients again - it is all peptides - of course! 2. 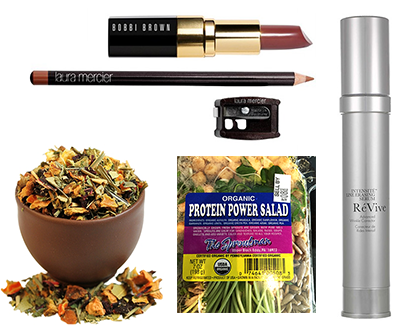 My March/April lip: Bobbi Brown Lip Color ($26) in Brown with Laura Mercier Defining Lip Pencil ($23) in Hazelnut Tea. The only thing getting me through this transitional weather. 3. The Sproutman protein power salad. Spring is coming and I am trying to detox. This sprout salad is packed with organic sprouted garbanzos, lentils, pea shoots, azuki sprouts and alfalfa. Great on top of kale with a green goddess dressing! 4. Capital Teas Organic Orange Grapefruit Wellness Tea. A loose tea filled with orange and tangerine pieces, blackberry leaves, apple bits, hibiscus flower and lemongrass. A treat without the calories! 5. The Macy's Board of Directors. 50% women and some of the most amazing women I have ever met! Most boards of Fortune 100s don't look like this!!! !